We’re currently completing a joint review of our shared workflow in the Maker Lab, focusing on how we manage our collaborative tasks, document our processes, log our research, and share our discoveries with public audiences and each other. As part of my research this summer, I’m testing and implementing that shared workflow as we look toward the “Kits for Cultural History” and “Z-Axis” initiatives in the coming year. Here, I want to briefly examine the Lab’s workflow, focusing on its role in scholarly communication, scalable collaboration, and graduate student professionalization. As my title suggests, our tools, practices, techniques, and shared values not only inform how we think, but also reflect praxis and its relation to humanities scholarship. As Alan Liu suggests in the March 2013 issue of PMLA: “Just as meaning [in digital humanities] is both a metavalue and a metaproblem, so is collaboration as it bears on such urgent issues in the digital humanities as coauthorship, collective project building, multigraph books, open peer review, social media, crowdsourcing, and the hiring and promotion implications of all these” (412). Thinking critically about how the Lab works as a team allows graduate researchers to explore the place of their work in relation to emergent changes in the discipline, and to do so through the everyday practice and stuff of research. As such, our choices about infrastructure have emerged from discussions at the recent Scholarly Communication Institute meetings on Rethinking Graduate Education, and they respond to changes in the humanities advocated by Bethany Nowviskie, Kari Kraus, and Kathleen Fitzpatrick. As I begin reading for the Department of English’s comprehensive exams in digital humanities this fall, working through digital methods (as they register changes in the discipline more broadly) adds an embodied, engaged, and tacit element to my graduate education that reading cannot provide alone. I will therefore pull back for a bird’s eye view of the tools and practices we are considering (for 2013-14) before returning to a view on the ground, where I will discuss the importance of humanities lab and makerspace infrastructures in rethinking how graduate students approach their research. 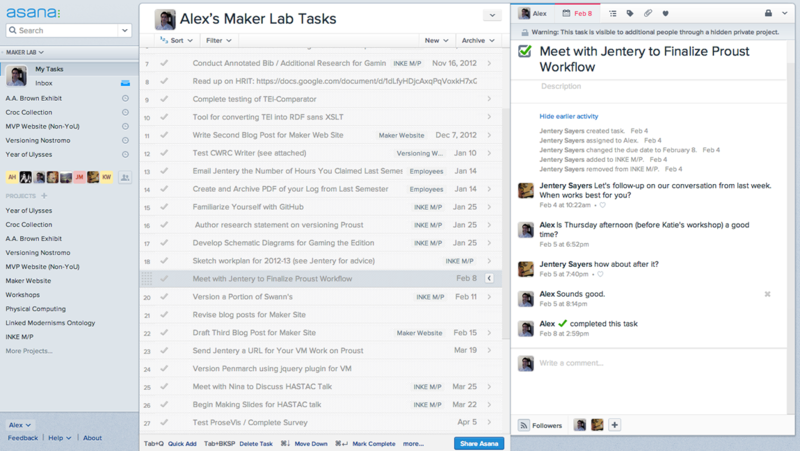 The Maker Lab’s workflow is currently divided into three principal sections: tasks, logs, and posts. My time in the Lab usually begins with a quick review of my ongoing projects and deadlines, which—in 2012-13—we managed using Asana. Asana’s web application lets us set due dates for tasks, share draft documents and other resources we’ve discovered, and send brief updates on the status of our work. By consolidating project updates, progress, and deadlines in one place, Asana eliminates the need to dig through my email inbox before returning to work on a project. Reducing e-mail is key to ensuring that project details don’t become fragmented and that collaborators remain updated with ease. Logging our work in the Lab is currently managed through GitHub, using a shared folder in the Lab’s “logs” repository, which—if only to decrease the stakes and pressure of regularly communicating our research—can be viewed and changed solely by Maker Lab members. 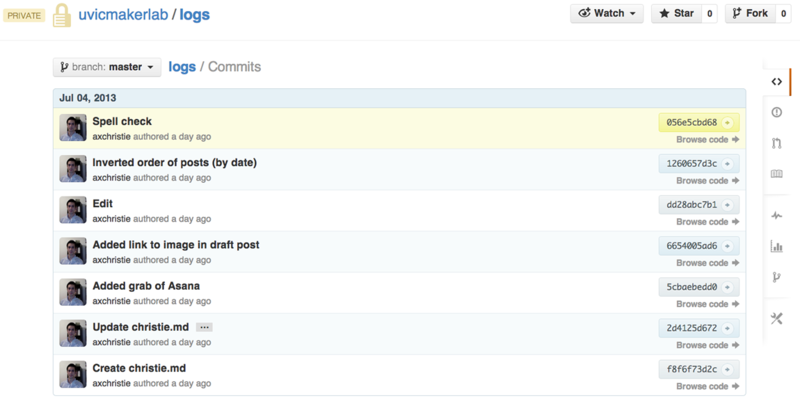 Each research log is maintained as a Markdown (.md) file, with new commits added under a header (h2) for each date. Whenever I am in the Lab, I typically log a list of work done along with screengrabs and a list of ideas and concerns for the day. These updates are then pushed from my local machine to the main branch using either the terminal or the GitHub client for Mac. This method allows us to maintain local access to our logs without relying on internet access. Pushing updates through text and screengrabs to a shared repository online (where the Markdown is displayed as html) also asks researchers to work through how this becomes that as we compose and format our logs (Fuller 85), push them from our local machines, and maintain conversations via GitHub. Working through GitHub promotes the concerns and approaches we share in the Lab, and it does so by asking collaborators to focus not only on what work we do as a team, but how we do it. We also use GitHub to facilitate conversations between researchers. For instance, everyone in the Lab can see and revise whatever I commit to our working repository, fostering dialogue across documents and revision histories. In my experience, a research and process log functions more as a conversational space than a record—I commit and push the work I’ve done on a given day along with thoughts, roadblocks, and concerns, which are then taken up via commit comments or inline feedback in GitHub. The blend of online communication (using Asana and GitHub) and face-to-face collaboration (in the space of the Lab) creates a feedback loop through which record-making becomes a venue for articulating and working through new ideas. In a lab focused on humanities inquiry, cultivating these moments of shared critical reflection through the platforms we use promotes the blend of algorithmic and critical inquiry that lies at the center of digital humanities research. The findings of our work are shared with a larger public through posts on this WordPress site. Each semester, we all try to publish at least three posts, with progress toward completion expressed through GitHub’s issue tracker and milestones, drafts and working thoughts shared via our logs, and final drafts submitted for internal review and copy editing prior to publication here. Integrating the documentation we generate across a range of media and formats is a key element of composing the posts. So far, we’ve worked with video, audio, posters, exhibits, plain text, code, and fabricated objects, not to mention a range of tools, methods, and publications. Communicating our work through a suite of media—from screengrabs to text to high-definition video—invites us to attend to and unpack the platforms, procedures, and strategies for sharing multimodal research on the web. Together, these three key elements of our shared workflow—tasks, logs, and posts—compose a set of shared resources and methods that teach us how humanities research can be collaboratively undertaken and shared with larger communities. However, these screen-based interfaces are also blended with hand-driven counterparts maintained in the space of the Maker Lab. Planning meetings for new projects always begin at the whiteboard, where we work through our thoughts as a group and draft them on the board. New items of interest are displayed on the large monitor in the Lab, and often prompt discussion as we turn from our workstations to discuss our shared problems in person. Questions about a research problem are frequently addressed by pulling a book from the shelves in the corner and consulting with a neighbor. That said, when I conceive of a shared workflow as infrastructure, I refer not only to a set of tools and tasks, but also to the objects, surfaces, and spaces through which collaborators build and share their ideas. Communicating through these resources, both on-screen and in-hand, lets us approach our graduate work through a range of scales and a variety of materials. While devising my approach to a new task, I will also think about how that workflow could be circulated via GitHub for others to fork and deploy at their home institutions. Working in the Maker Lab asks me to consider what collaborative projects and spaces produce and what venues, methods, and media exist for sharing that material with others engaged in similar work. I find that as we conduct our daily research in the Lab, my fellow researchers and I continually assess how scholarly communication functions across a range of scales, from the collaborator across the room, to research partners on Skype, to local and larger disciplinary communities. By enmeshing research in a shared, physical infrastructure, our workflow reconceives solitary research activities as collaborative practices that hopefully engage larger publics. Post by Alex Christie, attached to the Makerspace project, with the news tag. The last image aside, all featured images for this post are care of the Maker Lab’s use of Asana, GitHub, and WordPress (at maker.uvic.ca). The last image—of, from left to right, Katie Tanigawa (standing), Adèle Barclay (foreground), Shaun Macpherson (foreground), Nina Belojevic (background), Alex Christie (foreground), and Stephen Ross (foreground)—is care of Jentery Sayers.